Hatters boss Nathan Jones is well aware the his side need to watch out for Bury’s in-form attacker Nicky Maynard during today’s FA CUp second round clash at Gigg Lane. The 31-year-old has been sold for fees totalling over £5m in his career, with stints at Bristol City, West Ham United and Cardiff City. 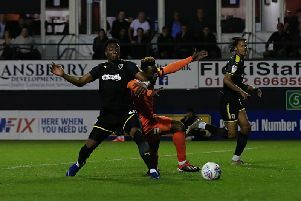 After a few barren years, he joined the Shakers in the summer and has netted eight goals in just 12 games, as Jones said: “They have a number of threats, Nicky Maynard is a player who’s had a fantastic career. “I played against Nicky a few times when he was at Bristol City, there’s a few others there that can hurt you too. The hosts are managed by Ryan Lowe, who had a fine goalscoring career himself, finding the net over 200 times, as Jones continued: “I know Ryan very well. “I’ve come up against him, his teams are a little bit like him, very attack minded. “He was a real good goalscorer in his time, he’s a, real character and that’s come out in his team. “It was a difficult job he took over last year and it was too good a squad to go down. “It was one of those where too good to down, but they weren’t. Although Bury are in League Two after relegation last season, Jones wasn’t taking anything for granted with the manner in which the Shakers go into the game, scoring 22 goals last month. He added: “We’ve got a really, really tough tie as they’re a very good side. “They’re in really, really good form. They have got too many good players to have gone down last year, and the majority of those players are still there, so it’s a really, really tough tie. "I’d have preferred to draw someone from League Two to League One, not because we think it’s an easier tie, it’s just someone different, otherwise it would have been just preparing like it’s another league game. "It is a very, very difficult tie, away from home, at a side that’s in fantastic form, so we’ve got to prepare in the right way. “They got a real good structure about them, got a really good footballing side as you'd expect, as the players they have there, I don’t think they could really play any other way. "They've got a wonderful squad, especially for the level, but for the level above, they’ve got a very strong squad. "So it will be a good footballing game, a real tough tie for both teams and one that we’re looking forward to." Meanwhile, Town attacker Harry Cornick is looking for another big day out in the competition after being part of the Luton who lost 3-1 at Premier League Newcastle United last term. He added: "Cup games are good, the FA Cup last year was good to us, we got the trip to Newcastle which was great for the fans and great for the players. "I’ve never played at a stadium that big, so it was a great experience for me. "Hopefully we can do the same again and go one better and try to pull out a (Manchester) United or a City and then try our luck against the big boys. "My debut for Bournemouth against Rotherham was in the third round, so that’s one I always keep close to my heart. "The FA Cup’s a great competition, lets try and get a big team, and could have a little day out with the fans which is lovely."